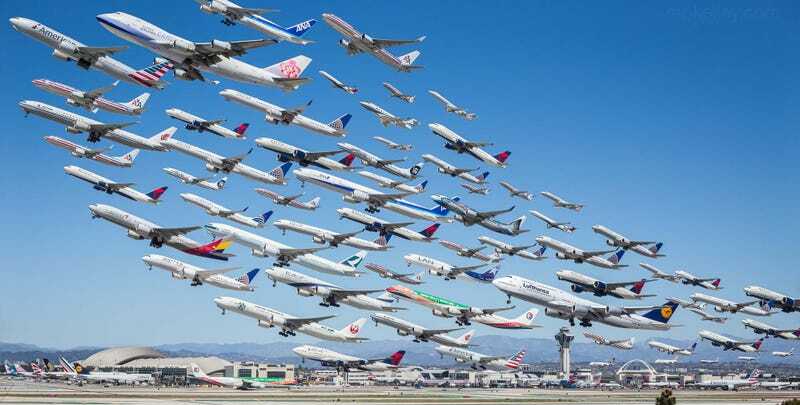 Los Angeles architectural photographer Mike Kelley posted this awesome image of almost all the departures and some of the arrivals at LAX during a period of eight hours last Sunday. You can buy the photo here if you want. This is (almost!) every departure and a few arrivals at LAX's south complex yesterday. I spent almost the whole day there and another eight or so hours in photoshop putting this all together. I took some artistic liberty with the angles of attack to make a more interesting photograph, but for the most part this is all very similar to how it would appear if you were to go and watch yourself. There are two runways and both were being used for takeoffs, so that explains the size differences and depth differences between the planes. If you look to the right of the tower, I also tried to get some of the heavies arriving. Singapore, Air France, Malaysia, Air New Zealand and Emirates A380s and 772s. Edit 1 : A lot of people are interested in buying prints. They can be had by going here. but they are fairly expensive as we print them on very high quality fine art papers. Edit 2: Because it doesn't seem to be clear and people keep asking, I took some artistic liberty with the planes and their angle of attack/pitch angle in order to make a more interesting shot. A few posts down in this thread is an unedited version, too. His is much, much better. It alsoreminds me of this great video, which is completely different but it's pretty much the same concept.